After so much anticipation! 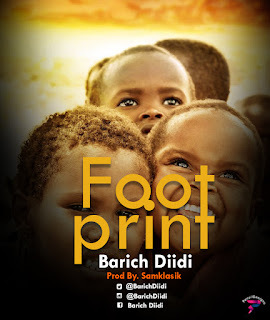 Barich Diidi releases an amazing and inspirational song - “FootPrint”. Lives of great men remind us that we can make our lives sublime and when departing we leave behind us footprints on the sands of time. The production credits goes to Samklasik of Klasik Empire, artwork design credits goes to Pencil Designs of Ayaya Media.